That’s my garden blogger’s imitation of Stanley Kowalski. Stella is back–Stella d’Oro, that is, probably one of the most planted perennials of the past 30 years, a plant that is both loved and disdained. I’ve heard it called,”the most worthless perennial of all time,” by Northern Gardener’s own Don Engebretson, a.k.a., The Renegade Gardener, and praised as “the most popular daylily selection of all time.” Of course, it’s possible to be both: Think reality television, Cheetos or stiletto heels. Here’s my take on Stella: If you’ve got a spot you don’t want to think about much, plant Stella d’Oro daylilies (Hemerocallis ‘Stella d’Oro’). They can handle full sun or mostly shade. They bloom consistently and prolifically from late June through much of July. Sometimes, they will re-bloom again late in the summer. Last fall, I had Stellas off-and-on into October–with absolutely no effort on my part. The flowers are a pretty yellow, though the foliage is a non-starter — and frankly it can be downright ugly in the wrong weather. Mine are planted on the north side of the house near some hostas that also require next to no care. They get a few hours of morning sun, but that’s it. 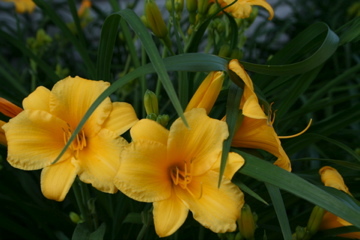 I’ve divided the daylilies once in nine years, though I think they could use it again. Stellas are a nice planting for absolute no-care areas, which is why you so often see them in shopping center parking lots.